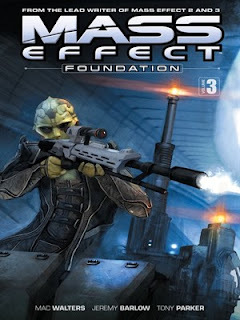 The lead writer of Mass Effect 2, 3 and these Foundation graphic novels, Mac Walters, is at the helm once again with volume 3. Tony Parker covers all the art in this book with Michael Atiyeh doing colors. This continues the story of Cerberus Agent Rasa while she investigates Mordin Solus, Thane Krios, Kasumi Goto, and Zaeed Massani. 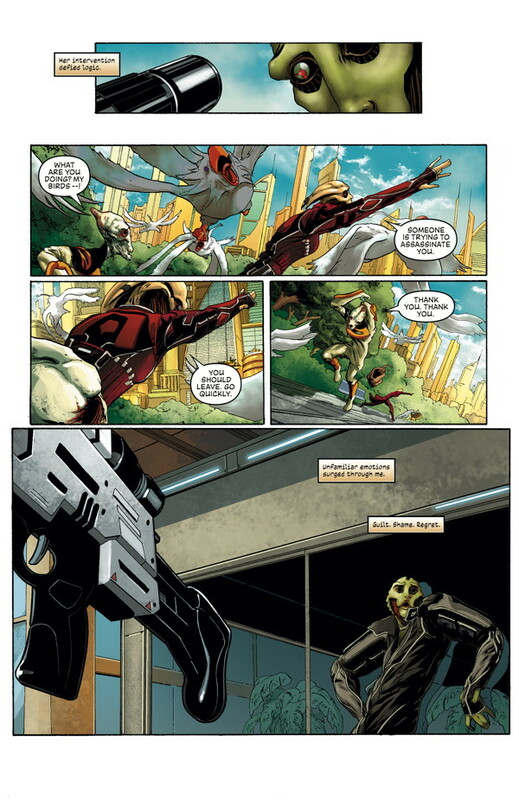 Volume 3 of this comic book series takes place before the second Mass Effect game. It starts off with Rasa recovering from her last mission in which she was apparently poisoned. I don't recall that being in the last book but it has been some time since I read the last one so I could be wrong. 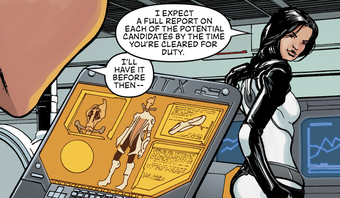 Regardless, Miranda shows up to harass and put Rasa on a new task. She is assigned to investigate characters that end up becoming crewmembers, cohorts, mission mates, companions, what have you with Commander Shepard in Mass Effect 2(and DLC). It's mostly the back story of Mordin, Kasumi, Zaeed, and Thane which are eluded to in the game but never fully explained. Now you get to see them in all of their artistic glory. Speaking of artistic glory, I must say that it is wonderful to finally have one consistent, solid, artist. All the other volumes have had multiple artists that were usually not consistent with each other. Sometimes it worked, sometimes it didn't. That's not a problem with this volume though. 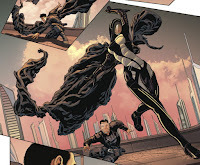 Tony Parker does all the art with the exception of colors done by Michael Atiyeh, and impressively so. Tony Parker excels at detail with environments mostly but also characters faces. Whereas the games are nice, sleek, and shiny, Parker shows a darker more gritty side of the Mass Effect universe. Each story has distinctly different aliens, worlds, and settings that set each other apart in tone, look, and feel. The colors just bring it home when it comes to those aspects as well since they all have different colors schemes and palettes. Your eyes never get bored as they are constantly getting visually stimulated. Even the paneling, design, and structure are unique, different, interesting, and intriguing. Sometimes it's a classic layout, thematic, or experimental and they all work so perfectly. The story flows better than ever in this volume. All the credit does not go to the artist though as Mac Walters and Jeremy Barlow weave the story masterfully with the art. Everybody is at the top of there game in this trade. They finally have the formula, talent, story, art, colors, dialogue, character all hammered out to it's highest quality. Unfortunately, it appears this is the final volume which is quite unfortunate considering the crazy, ballsy, mind-blowing, cliff hanger ending. Nonetheless this is easily the best Mass Effect graphic novel I have read to date. Even if you've never read any of the previous two volume it would be easy to get on board this one. For all these reason I must give this a STRONG BUY especially for Mass Effect fans. TNTM Comicast #219 Spidey Europa! !